EXCLUSIVE! Celebrate what makes your four-legged companion unique with these personalized cat breed architectural renderings. 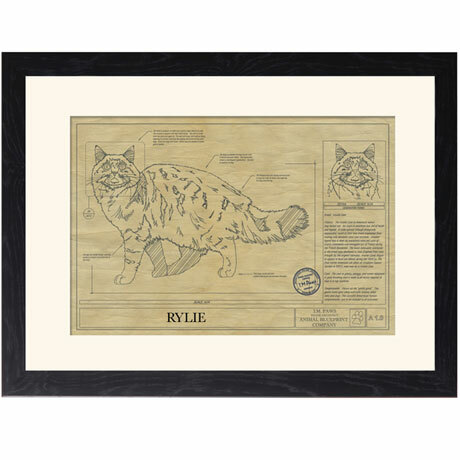 Based on actual 1950s working blueprint plans, each is rendered with schematics and notes calling out the special features and history of each breed and is personalized with your beloved cat's name. The print has a distressed finish and the highest quality museum-grade paper is used to be sure that your art lasts longer than your cat's 9 lives! Standard Frame: 19"x 25" - Print: 13"x 19". Black frame, archival acid-free white mat. Each is framed behind Plexiglas in a made in the USA 100% poplar wood frame, and the art is printed, framed, and shipped from the USA. Indicate cat's name to personalize, up to 12 characters. Personalization is in all capital letters. No rush shipping. Please allow 3-4 weeks for delivery. Item can only be shipped within the Continental US.